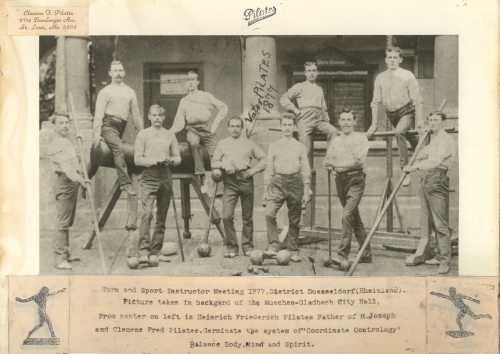 The picture of Joseph’s father Friedrich Pilates in the middle of a group of gymnasts posing in front of Gladbach city hall is one of the most exciting exhibits of the city archives in Mönchengladbach. It is worth it to take a closer look, because it can tell us a lot about gymnastics (Turnen) and its influence on Joseph Pilates and his method! 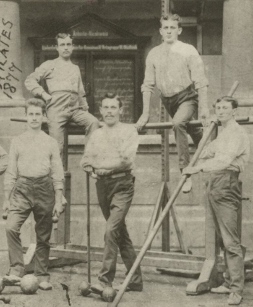 The men posing in front of the city hall have brought several pieces of gymnastic equipment. Let’s have a look at Joseph’s father. Friedrich Pilates is holding a barbell: a bar with iron balls on both ends. On the floor are some small barbells. These pieces of equipment show that Friedrich Pilates was practicing heavy athletics in his gymnastic club: strength training, weight lifting etc. 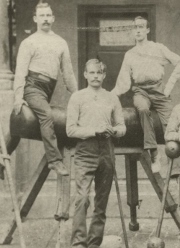 In the late 19th century heavy athletics was only just developing. It was quite extraordinary that Joseph Pilates was shown the basics of strength training when he was still a boy. It was the perfect starting point for someone who would later develop a successful strengthening method himself. The next cutting shows two gymnasts sitting on the pommel horse, one of the classical pieces of equipment of German gymnastics. Friedrich Ludwig Jahn, well known founder of German gymnastics, had introduced the pommel horse under the name of “Schwingel” (I’m sorry: I have no idea how to translate that). This piece of equipment is made out of wood and leather. The same materials that Joseph Pilates used when he started building his own apparatus like the Reformer. He had been familiar with the feel of the surface and the smell of these materials since he was a kid. Let’s take a look at a third cutting. It shows two more pieces of traditional gymnastic equipment: the parallel bars and the pole for pole-vaulting. The history of pole-vaulting leads back into ancient Greece. Throughout his life the Greek athlets were Joseph Pilates’s ideal for a good way of treating one’s body. (As Raphael Holzdeppe showed wining silver at the athletics world championship in Peking pole-vaulting is still a favorite event among German gymnasts: Congratulations!) The parallel bars are the big piece of equipment in the background, they were also developed by Friedrich Ludwig Jahn. But: the story of how this picture made it to the city archives of Mönchengladbach is almost more exciting than the picture itself! See the label on the left hand side? It’s a clue. This is the address of Joe’s brother Fred Pilates (=Clemens F. Pilates) in St. Louis. When he emigrated to the United States 1923, three years earlier than his brother, he took along this picture of his father. Six decades later, in 1982, Mary Kay and Fred Gladbach, a couple from St. Louis, went on a trip to Europe. One stop was Mönchengladbach where they visited the city archives, because they wanted to find out whether the surname “Gladbach” came from ancestors in this city. Unfortunately they didn’t find anything, but they made the best of it and went sightseeing in the beautiful historic city center of Gladbach. Back in St. Louis some years later at a garage sale they discovered the print of a historic photo showing the yard of Gladbach city hall! The surname Pilates didn’t ring a bell, but they were so happy about their find that they bought the picture at once, paying 15 dollars. The Gladbachs commissioned a reproduction of the picture and sent it to the mayor of Mönchengladbach who gave it to the city archives. 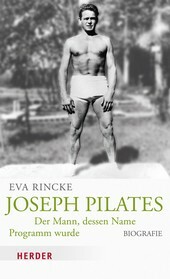 After two more decades had passed, in 2004 archivist Gerd Lamers suddenly recalled the picture when people started asking him about Joseph Pilates, so he added it to the collection about Joseph Pilates. It is thanks to this fortunate chain of coincidence that we can enjoy this picture! 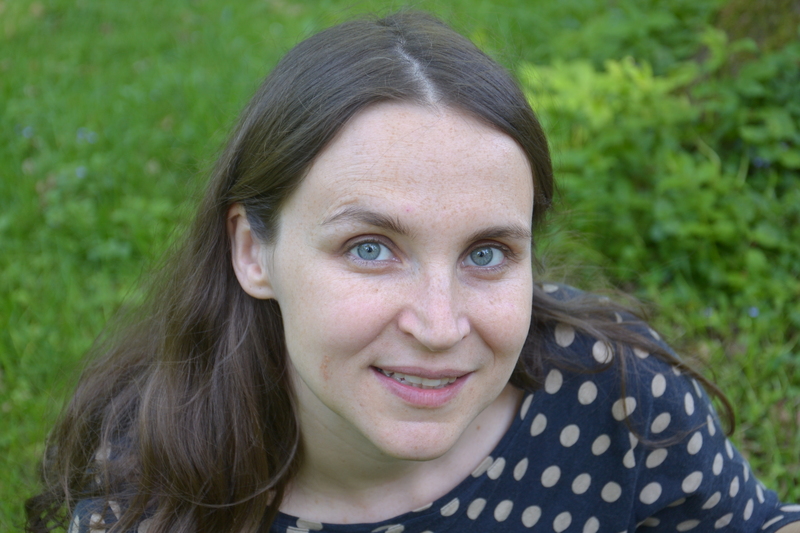 Many thanks to the city archives of Mönchengladbach for the permission to use the photo! I’ve heard about this but never seen. Thank you so much for sharing.